Ancient walls forming part of the fortifications at the entrance to Valletta have been unearthed during digging works in connection with the rehabilitation of the entrance to the capital city. These remains were found on the former site of the public toilets during works for the building of a new plant room as part of the Triton Fountain restoration project. The Infrastructure Ministry said in a statement that as soon as the discovery came to light the Superintendence of Cultural Heritage was notified and discussions were held, during which it was decided that more archaeological investigations be carried out. Works in connection with these investigations are presently under way under the direction of the Superintendence of Cultural Heritage. The Superintendence has also called for this discovery to be afforded protection and integrated into the project in a way which will allow the wall to remain visible to the public. For this reason, discussions were held together with the GHRC for this area to be roofed over and to remain accessible to the public as part of the Tritons Square project. In light of this discovery some changes were made to the sub-station plans in order to avoid any impact on the new fortifications. It was established that because of this discovery some modifications will be carried out to the structure of the sub-station in order to provide access for the discovery to be enjoyed by the general public. 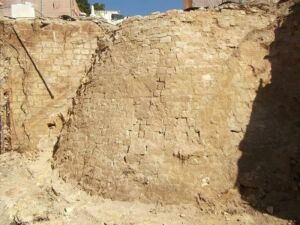 The ancient walls are being uncovered for documentation and archaeological investigation works to be carried out. This zone is known for its cultural importance as it includes fortifications of the entrance to Valletta, among them structures and also a ditch excavated into the rock. The discovery of these remains was unexpected, as it was probably a modification to the original plans and could have been added over the years.